Preheat oven to 175°C/350°F. Line cupcake tins with liners. Combine flour, starch, baking powder, and some of the salt in a bowl and set aside. Add butter and sugar to another large mixing bowl and beat until fluffy and lightened in color. Beat in eggs one by one, then add vanilla extract and rosewater. Alternate adding flour mixture and milk to batter. Mix briefly until dough just comes together. Use an ice cream scoop to add an even amount of batter to each cupcake liner. Bake at 175°C/350°F for approx. 18 – 20 min., or until a toothpick inserted into the center of each cupcake comes out clean. Let cool completely. To prepare the buttercream, set up a double boiler by placing a heatproof bowl over a large saucepan filled with simmering water. Add egg whites, remaining sugar, and salt to bowl and whisk together. Keep whisking for approx. 5 min., until temperature has reached 71°C/160°F. Remove from heat. Add remaining rosewater and vanilla extract and whisk egg white mixture until stiff peaks form, and it has cooled down to room temperature. Cut remaining butter into small pieces. Incorporate little by little into stiff egg whites. Add confectioner’s sugar and keep beating until cream is homogenous and shiny. Place nozzle in piping bag and fill with frosting. Refrigerate, if needed. Frost the cupcakes by working your way from inside out, drawing upwards in circles. 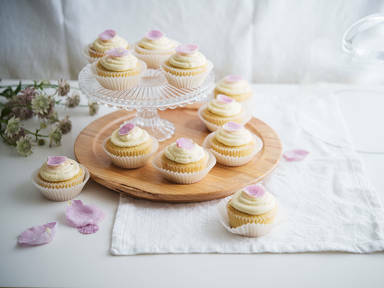 Decorate each cupcake with a sugarcoated rose petal. Enjoy!